My house has been decorated and ready for Halloween since September 28th. I couldn’t wait another single day and was dragging down all my totes by myself while Jorge was at work. I was so ready for pumpkins, witches and my adorable front porch Jack ‘O Lanterns to show up again. I have been walking the Halloween aisles at Target and Kirklands for weeks dreaming up ideas for Halloween. 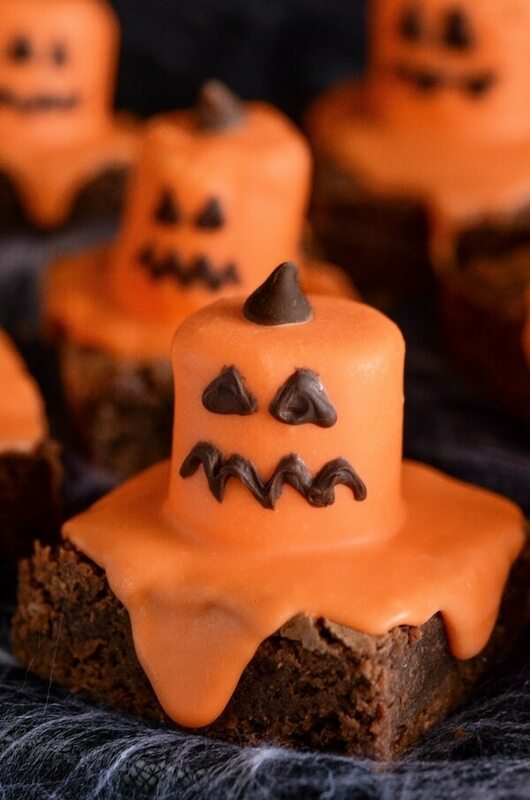 I just loved the idea of turning marshmallows into Jack ‘O Lanterns…and what goes better with brownies than marshmallows? 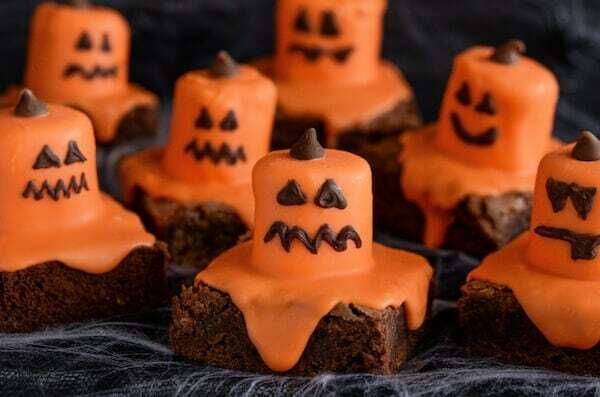 So here we are, Melted Jack ‘O Lantern Brownies. Aren’t they adorable?? I was so happy with how these turned out and they couldn’t have been easier. I was worried they might turn into quite the project, but I am happy to report they really weren’t too bad to make. I whipped up a batch of brownies in the morning and let them cool. Once I had the girls down for nap, I quickly melted up my orange candy melts and dipped in my marshmallows and placed them on top of the brownies. I quickly tapped the entire brownie on the counter top a few times and the orange candy melt smoothed out right into place and I dropped on a little chocolate chip on top as the pumpkin stem. It took a few minutes to harden, and then I just pipped on the faces with some melted dark chocolate…and BAM. Jack ‘O Lanterns! For all my fellow Halloween lovers – last year I made some awesome pretzel spiders made with a Reese’s Peanut Butter Pumpkin that you just have to check out. And coming up early next week I have a super adorable (EASY) Halloween float idea that you are all going to LOVE. So, so cute! Pinning on my H’ween board! I adore these brownies!!! So darn cute! So flippin’ cute – love these! These are adorable! 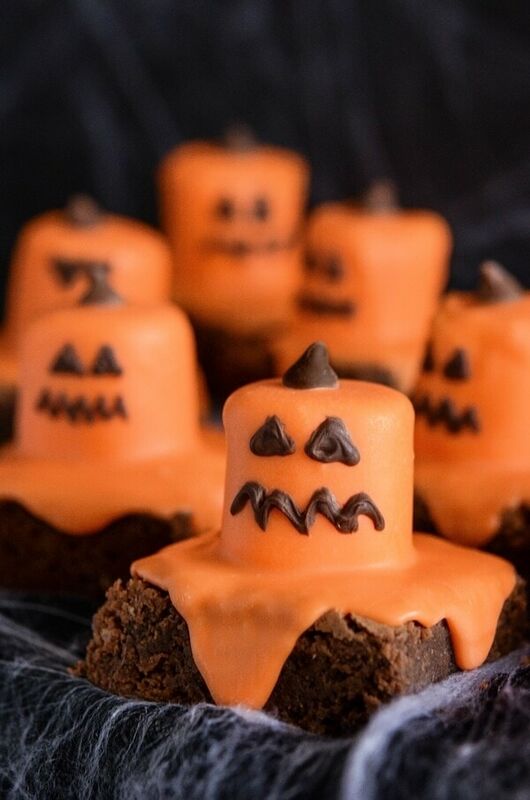 I can’t wait to make these for my family on Halloween! These are super cute and so simple! We’ll totally be making them! I saw these and was going to try them. However, there were no orange candy melts in the store with it being so close to Halloween. However, I got an idea. I bought YELLOW melts and bought minion eyes. I am going to attempt to make minion brownies, same idea! That is brilliant! I love that idea! if you do make them, please share pictures!